Once you get past the fundamentals you’ll find yourself looking into specific areas of study. These areas can relate to figure drawing, perspective, general rendering, or more detailed subjects like animals. Life drawing techniques are always valuable for studying any subject. But the intricacies of animal anatomy are most often learned from books. In this post I’ll share the best books to help you study animals from basic drawing & construction techniques to detailed anatomy guides. Regardless of your current artistic skill I guarantee there’s something in this post to help you improve. Author Ken Hultgren is a former animator at Walt Disney and he has years of experience to back up the writing in this book. The Art of Animal Drawing teaches how to look at animals from two perspectives: realism and cartoony drawings. Detailed construction is vital to the accurate design of animal illustrations. But you’ll also need to consider gesture, weight, movement, and realistic animal anatomy. Hultgren covers all of this while sharing tips to improve your drawings along the way. You’ll learn how to break animal figures down into common forms like spheres and cylinders. This way you’ll have an easier time rendering in detail and sketching from your imagination. While this book is a tad thin it’s also incredibly dense with information. And if there’s anyone I’d trust to teach animal drawing it’s a former Disney animator. Everyone from sculptors to 3D animators and digital artists can learn from studying anatomy. There’s a lot to learn and it’s not a topic you master in a month(or even a year). But much like the human figure there’s also many animal anatomy books for artists. 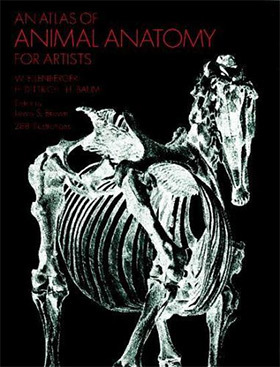 An Atlas of Animal Anatomy for Artists is one of the best you can get. This book covers the skeletons, muscles, tendons and outer layers of skin for a number of common mammals. Unfortunately it doesn’t get into sea creatures, but it is a good place to start for beginners. I’ve yet to find a single comprehensive animal anatomy book covering everything. Probably because there are just so many animals that it’d be impossible to do them all. 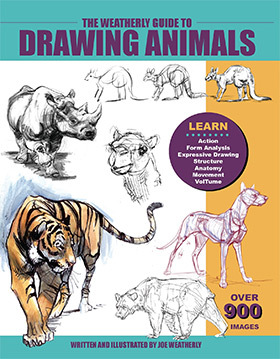 But this book is a great place to start for drawing common animals like dogs, horses, cows, and lions. 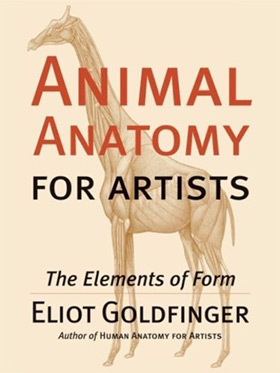 For a much deeper look into animal anatomy I’d recommend Animal Anatomy for Artists: The Elements of Form. This book totals 256 pages and it doesn’t just focus on singular animals. Instead you’ll learn about muscles and how they connect on a variety of animal body types. This is much more valuable to an artist who can extrapolate the information across a broad range of animals(for example, rhinos and hippos). Artists should do their own research and keep themselves educated on the nuances of animal anatomy. But there is no wrong way to study and everyone needs a jumping off point. Also this book was written by Eliot Goldfinger who’s also the author of, in my opinion, the best human anatomy book available. I trust his teaching style and definitely recommend all of his books to serious artists. Learning to draw animals the right way helps a lot whether you want to become an illustrator, painter, sculptor, animator, or any other type of artist. 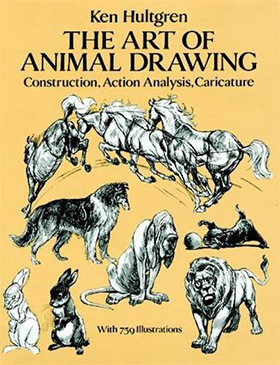 The book Animal Drawing: Anatomy and Action for Artists teaches less about detailed anatomy and more about drawing. You’ll learn techniques for rendering shadows, skin, fur, and more importantly accurate poses for each animal. You get a wide variety of animals to study including most zoo animals like gorillas and giraffes. But you’ll also learn about sea creatures and the differences in scaly skin. Birds are another topic of discussion since their feathers are often difficult to render for beginners. This is less of a detailed anatomy book and more of a guide to actually drawing animals realistically. I’d highly recommend grabbing this before you head to the zoo for some pointers during your sketching sessions. If you ever want to do concept art then you’ll need to master drawing from imagination. This is no easy task but if you study the forms first you’ll have a much easier time breaking down subjects into simpler sketches. The Weatherly Guide to Drawing Animals relies on this strategy by teaching artists how to break down animals into their simpler forms. Anyone can pick up this book from any skill level and learn a lot from the exercises. But it does move fast so you probably won’t complete the exercises too quickly. Instead I’d recommend working slowly to gather as much knowledge and maintain it for as long as possible. Weatherly shares lots of diagrams and drawings in the book so you can see how he approaches animal drawing. But you should only use these as suggestions to help you find your own style of drawing animal creatures from life. The right drawing techniques can be all you need to take your game up to the next level. 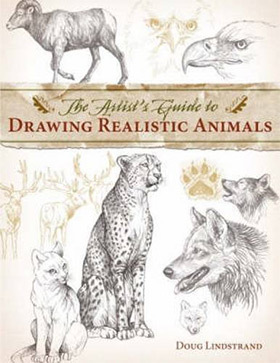 Life drawing is a crucial step to this process and The Artist’s Guide to Drawing Realistic Animals can teach you little tidbits along the way. The author Doug Lindstrand has over 30 years experience observing animals in the wild and studying how they move. He teaches in a step-by-step approach using lessons and guided exercises to help you achieve a realistic end result. Through a series of 43 different exercises you’ll learn how to render fur, how to capture snouts, how to draw different poses and how to study a wide variety of animals. You’ll start with basic sketches and quickly learn how to break down animals into their individual parts. I love this book for its simplicity and practicality. Definitely a nice book for beginners who want to learn the constructionist approach to drawing from life. Illustrators and concept artists need to come up with unique ideas that don’t exist and paint them as if they did exist. This is exceptionally difficult but can be learned with lots of practice. I recently covered some creature design books that deal with imaginary drawing. Most of those books would be helpful study resources along with Animals Real and Imagined. This book teaches you how to render ancient creatures like dinosaurs without actually looking at one. The book is filled with notes and anatomy sketches for these imaginary creatures so you can see how they might be imagined in the mind of a professional artist. These diagram sketches include the bones and muscles so you can even understand the movement patterns of these creatures. Anyone looking to start with life drawing should skip this book. It’s meant solely for imaginary creatures and won’t help you draw your pet dog or goldfish. However once you get into creating professional concept art you can glean a lot from the examples and suggestions in this title. 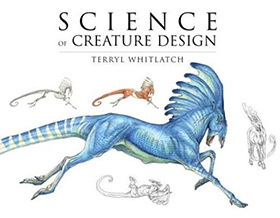 Much like the previous book I’d also recommend Science of Creature Design to any aspiring concept artists. This book flips the idea of drawing on its head by studying the concepts first. Instead of looking for something to draw you’ll find ideas and consider how they could be drawn. Designing a creature from scratch can be broken down into a straightforward process. No it’s not easy. But it is possible to learn and even master. 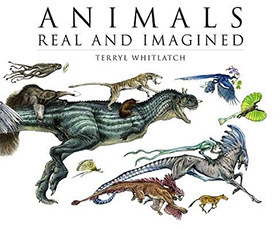 The author Terryl Whitlatch worked for Disney as a creature artist on films like Jumanji and The Polar Express. She shares her years of experience in this book which can be invaluable to young artists. I tend to avoid these “masterclass” books because I rarely find any with depth and substance. However Animals Drawing Masterclass is a nice exception, albeit still not quite true to the name. The book is only 96 pages long so I’d hardly call this a master class. 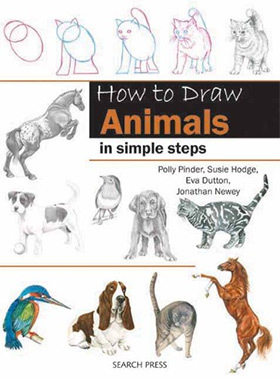 But it does come with great exercises teaching you how to draw animals in a step-by-step fashion. These even include video references if you want to study each step of the way. Drawing animals can only get better the more you practice, but the right kind of practice matters. I’d recommend this book to someone who has a bit of experience and really just wants to focus on animals. It’s a fairly quick series of lessons and the techniques may offer some insight to help you reach that next level of drawing. 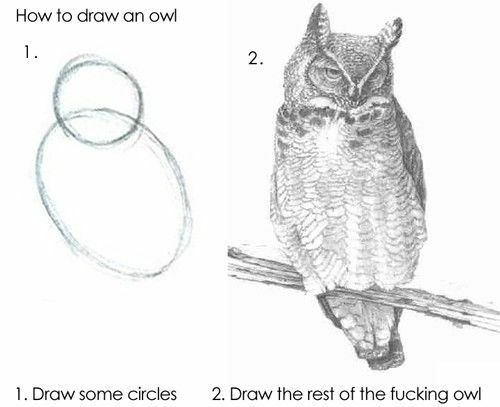 Everyone mocks the goofy online tutorials of how to draw an owl that resemble the absurdity of teaching someone to draw. The early sketches in this book may resemble this same pattern, but you’ll learn a lot more about the techniques as you move through the chapters. I commend How to Draw Animals for keeping the process simple yet relatable. Young artists and even kids may be able to follow the early lessons in this book. It focuses primarily on house pets which are found everywhere and super easy to reference. In 144 pages you’ll learn how to break animals down into forms, render the minor details, and bring drawings to a finished polish in no time. This book makes it easy to get started but it will not teach you everything. Pick it up if you’re new to drawing and be willing to move on when you’ve mastered the lessons. 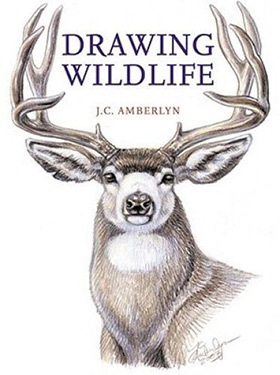 Artist and photographer J.C. Amberlyn combines her love of animals into her book Drawing Wildlife. The early chapters talk about basic animal anatomy and quickly move into more detailed topics of rendering and construction. 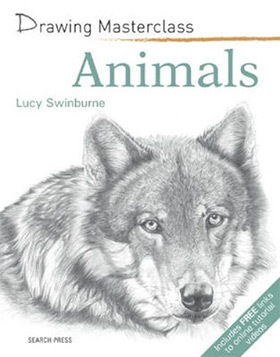 Over 300 different animal case studies are used throughout the book to illustrate drawing techniques. The three main animals covered are carnivores/omnivores, smaller mammals, and hoofed mammals. As you can tell this is much more of a woodsy type wildlife book so there is nothing about drawing sea creatures. But the details you do get are phenomenal along with very high quality photos. The goal here is to tone your traditional art skills and help you build a visual library for your drawing exercises. A great book for wildlife fans but like most books it will not cover every topic. But regardless of topic I guarantee there’s at least one book in this list that’ll help you out. Drawing animals is no different than drawing people, cars, or objects. You study the fundamentals first and learn how to apply these skills into any subject matter. Take a look over this post again to see if anything catches your attention. 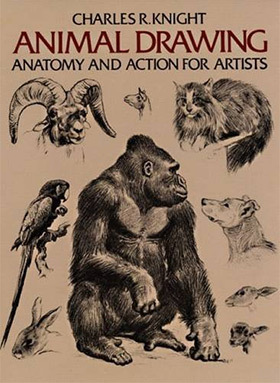 If you’re just starting out I’d recommend a general book like Animal Anatomy for Artists: The Elements of Form which covers anatomy and drawing techniques. From there you can always branch out into more specific titles or even browse for new & upcoming animal drawing books.